Sift together cake flour, 1/3 cup sugar, salt, and baking powder and set aside. Combine egg, water, and oil, add to sifted ingredients. Mix batter until smooth. In a separate bowl, whip egg whites with cream of tartar. Gradually add 1/4 cup sugar and continue to whip to form a stiff meringue. Fold batter into meringue and mix thoroughly. Pour into an un-greased 9 inch round cake pan and bake for 30 minutes. Invert cake onto a rack and cool. To make pastry cream: Scrape vanilla bean seeds into milk and bring to a boil over medium heat. (Add vanilla bean pod to milk as well). Combine sugar, flour, egg yolks and whip until light yellow. Slowly pour 1/3 of the hot milk into the egg mixture to temper it. Add milk-yolk mixture back into remaining milk and cook over medium heat, stirring constantly until thick. Remove bean pod and strain, set aside to chill. Cut cooled cake into three layers. Stir 3/4 cup of coconut flakes into pastry cream. Spread cream between layers of cake. 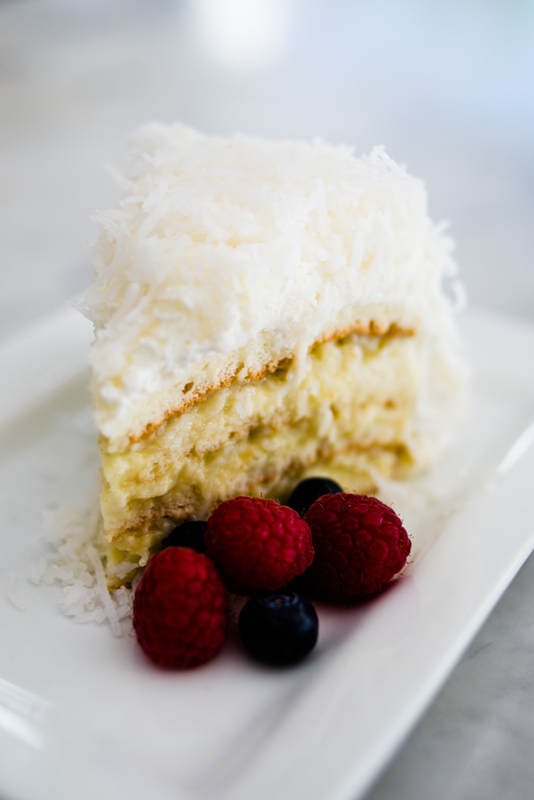 Frost top and sides of cake with remaining whipped cream and sprinkle with remaining coconut flakes.